Peter Jackson has saved his best Middle-Earth movie for last. I know — it sounds like I’m baiting a hook just to get you to read about a documentary. But no, I’m serious: If you want to understand The Lord of the Rings, you should probably understand the furnace into which Tolkien was thrown, from which he somehow emerged alive, and by which a fire was lit within his mind and heart — an ache that could only be expressed in languages he invented, in vocabularies beyond the limitations of realism or allegory. 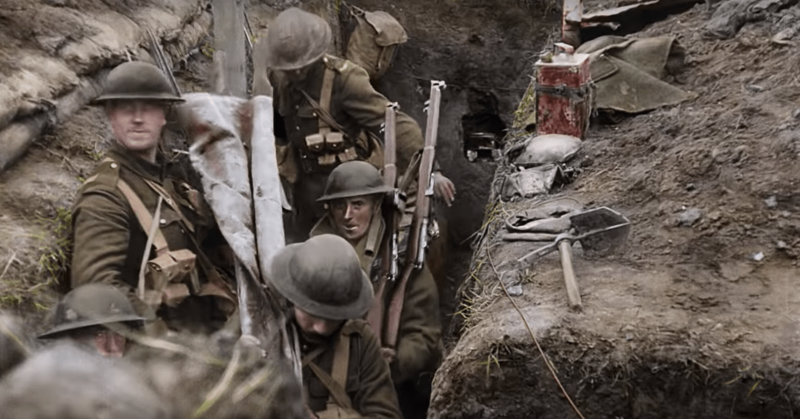 It would be inappropriate to treat The Battle of the Somme, the bloodiest and deadliest day in the history of British military engagement, as a footnote in the life of the guy who gave us Hobbits. Tolkien’s service there is not why the subject interests me. But I am interested in how a story that goes on inspiring readers with beauty and hope was born from such a hellish occasion. And so it’s remarkable that Peter Jackson, whose big-screen adaptations of Tolkien’s beloved fantasy trilogy were so celebrated (and whose three film adaptations of The Hobbit were maligned, and rightly so) would be the driving force behind They Shall Not Grow Old, an extraordinary tapestry of World War One testimonies by the surviving soldiers who were sent into that madness against the Germans. Honoring these intimate archival recordings, Jackson reveals harrowing accounts of the misleading propaganda that summoned so many young men, the dehumanizing pressures of the war, the particular chaos and slaughter of the Somme, the burdens that the survivors would have to carry, and the betrayals, abandonment, and loneliness that awaited those few who returned. And as we listen, he fills the screen with highlights (that word sounds trite and inappropriate here) from more than 600 hours of material from the Imperial War Museum and BBC archives. Much of it is sharpened and focused, but then, as in Wings of Desire and The Wizard of Oz, its black-and-white footage suddenly blooms into color and detail that takes your breath away. The footage casts no doubt on the grim and grisly testimonies. 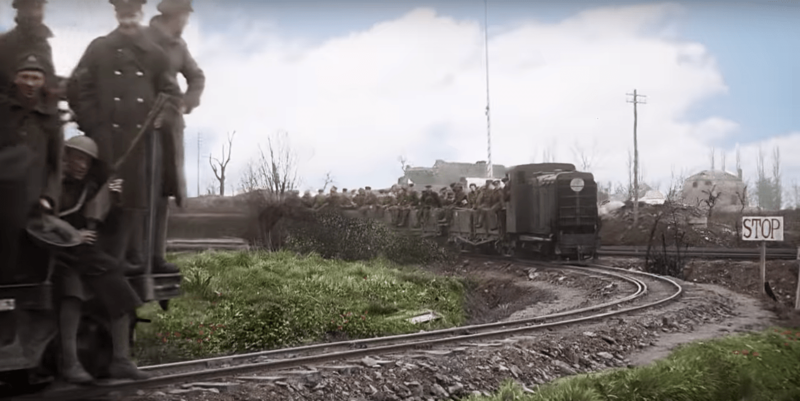 I know that much of this imagery has been easily accessible for many years, but it is another thing to see it on a grand scale, so carefully restored, so wisely organized and edited. I won’t soon forget the stories or the images: Bodies bent at unnatural angles. 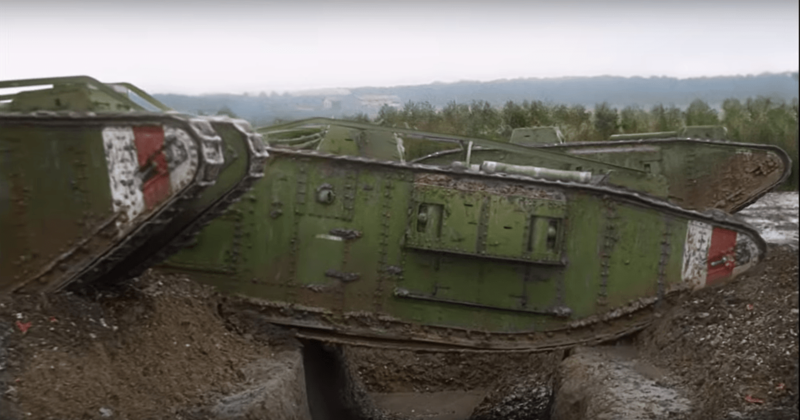 The mud that swallowed soldiers whole. 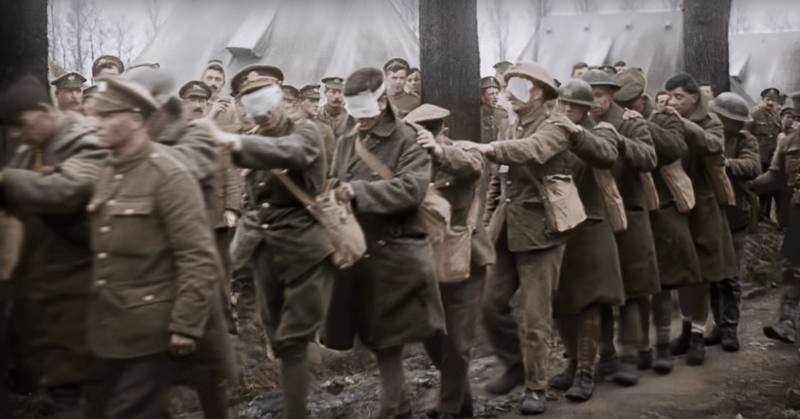 A parade of men in blindfold-bandages suffering from mustard-gas blindness. Vast fields of dead rats. As we look back at gazes both solemn and snarky, frightened and fierce, we’re often aware that a soldier’s expression was one of the last pleas or semblances of strength he ever expressed. Evil in Middle Earth is above all industrialised. Sauron’s orcs are brutalised workers; Saruman has ‘a mind of metal and wheels’; and the desolate moonscapes of Mordor and Isengard are eerily reminiscent of the no man’s land of 1916. The companionship between Frodo and Sam in the latter stages of their quest echoes the deep bonds between the British soldiers forged in the face of overwhelming adversity. They all share the quality of courage which is valued above all other virtues in The Lord of the Rings. And then, when the war is over, Frodo shares the fate of so many veterans who remain scarred by invisible wounds when they return home, pale shadows of the people that they once were. 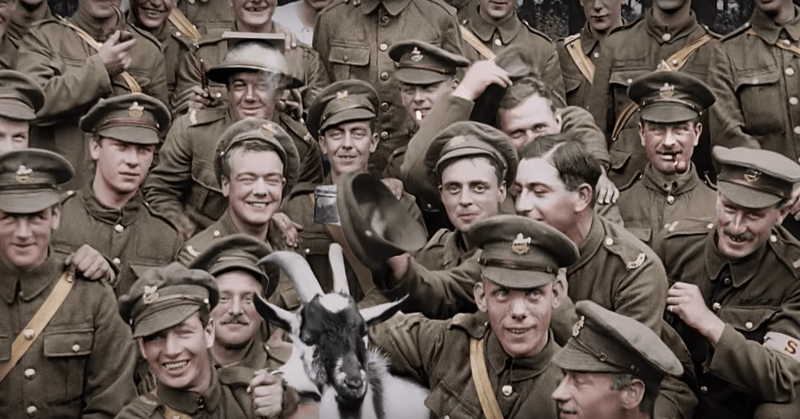 In They Shall Not Grow Old‘s making-of presentation (a 30-minute exhibition that has been offered post-credits during the theatrical run, and that will undoubtedly appear in an expanded exhibition on home video releases), Jackson goes into great detail to describe the challenges that colorization artists and restoration technicians faced in fulfilling his vision, as well as the vast resources they needed in order to approximate the appearance and sounds of the battle. I agree with film critic Michael Sicinski that these endeavors to approximate the original colors and details aren’t entirely convincing. In notes at Letterboxd, he remarks, “We never forget we are watching something additive, not organic.” But still, I cannot underestimate how impressive the results are. They look more like the imagery of dreams than footage of a battle currently in progress. However, that’s not the most important part of this experience. In this, I agree with Sicinski again: The real treasure here is “an unusually brilliant collage of pre- and mid-war footage together with the first-person recollections of dozens of British vets, their voices weaving in and out of each other like a nation’s chorus.” This is not a case of “Go big or go home.” The home video experience will be similarly impressive because the most influential, inspiring, and sobering aspect of the film is its relentless reel of audio testimony from the soldiers themselves. They tell their own stories, recounting the propaganda and recruiting techniques that persuaded them to leave home, to give up their belongings, to head out into the trenches, and then to learn that nothing could have prepared them for the forces that would overwhelm them. I hear a strange and unsettling compliance in the voices of these old men as they talk about being young men eager to get involved. It isn’t so strange that boys would want to serve their country. But the lack of questions or hesitations when it comes to what they might be asked to do, what ethical questions might come into play — that I find difficult to understand. Critic Steve Sheehan at The Digital Fix argues that the movie is too relentless, too crowded. “These men’s stories need to be heard but they also deserve to be given space to breathe. For the audience to digest and process the enormity of what they are seeing, the words and pictures need more time to settle.” Perhaps. I tend to think that the relentlessness of the testimonies represents, to some extent, the experience of being there: They did not have time to breathe as the madness unfolded around them and demanded everything of them, so why should such testimonies be padded for our comfort? And yet, instead of any survivors’ testimony, or the faces of any of the 700,000 British soldiers lost in this war, the voice that haunts me after this movie is Frodo’s. In the aftermath of his devastating quest, as he prepares to depart a land deeply scarred by the insanity of war, he laments, “I tried to save the Shire, and it has been saved, but not for me. It must often be so, Sam, when things are in danger: some one has to give them up, lose them, so that others may keep them.” This is Tolkien’s testimony, sewn into the tapestry he wove from his longings, his wounds, and his grief. 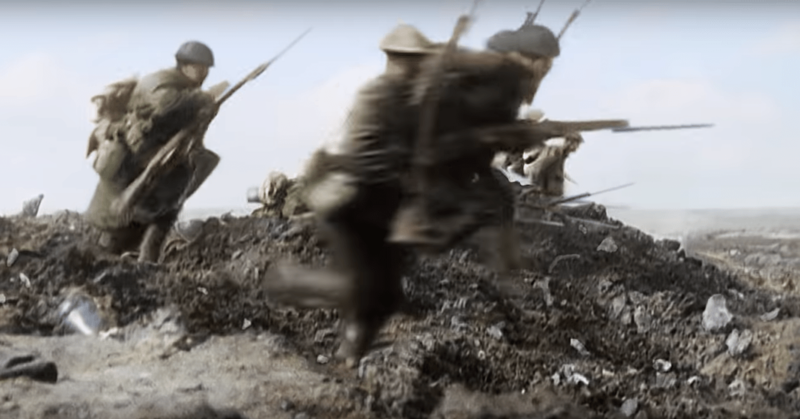 I have been angry for a long time about how Jackson too often cheapened Tolkien’s wartime stories by making them too much like the stuff of video games, too little like the echoes of real-world anguish. But They Shall Not Grow Old is a tremendous and sobering work. It honors those who gave up their own free lives that many more might be born into their own. May these testimonies be salt and light in a world that seems increasingly likely to fall once again into madness, into battles that might not leave anyone left for testimony. I don’t usually seek out 3D versions of films because they don’t usually improve the film and usually give me headaches, but I took a chance with this one and was impressed with how it gave the stories depth. Thanks, Mike. I didn’t get to see it in 3-D, but you’re not the first one to tell me that it was worth it. I’m thinking about seeing it again if I can catch a 3-D screening in Seattle.